The CCP and the "Fear of the Mosque"
While much of the planet continues to ignore what happens every day in China, the academic world (or at least a significant part of it) asks the international community to save the ethnic minorities and religions persecuted in that great Asian country. A special light on the severe situation afflicting the “autonomous” region of Xinjiang has been aptly lit by the Symposium on the mass incarceration of Uyghurs in China, organized and coordinated in Washington, D.C. by Sean R. Roberts, a cultural anthropologist at the Elliott School of International Affairs (ESIA) of the George Washington University (GWU). 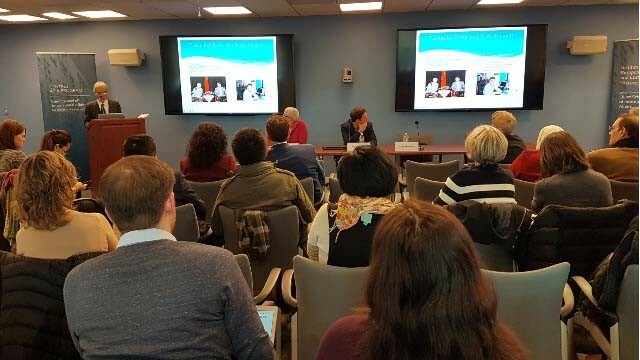 The part of the Central Asia Program of the GWU’s Institute for European, Russian, and Eurasian Studies of the conference was held on Tuesday, November 27, in the Lindner Family Commons of the ESIA. On the eve of the conference, November 26, Roberts and several of his colleagues scheduled to speak at the event the following day conducted a significant press conference at the National Press Club in Washington, D.C., to denounce ‒ with no fear for their career, as they have stressed ‒ the repression in Xinjiang with the launch of a statement signed by 278 scholars from 26 countries and multiple academic disciplines calling for the immediate cessation of all forms of coercion and harassment implemented by the central and regional government of China against the Uyghurs. Now, it does not happen every day to see expert scholars and tough men shed their tears in front of journalists and cameras. But this is what happened on Monday when, helped by an interpreter, Mihrigul Tursun, a 29-year-old Uyghur, took the microphone ‒ also in tears. She ended up in a nightmare that has marked her body and soul forever after one day she decided to go to Egypt to study English and thus got caught in a vague, unfounded accusation of espionage. She and her three young children (one of whom died) have been abused in every imaginable way. She has been incarcerated in literally inhumane conditions, forced to endure the violence of all kinds and compelled, along with her children, to take unknown medicines. 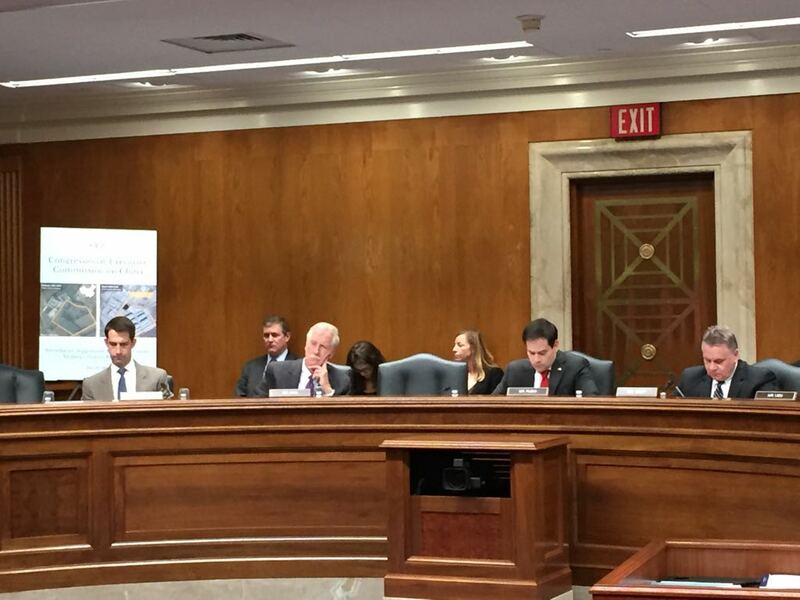 Thanking the United States for giving her the opportunity to live in a free country where she can be an Uyghur and live her Muslim faith without fear, the young woman closed her testimony with two appeals. 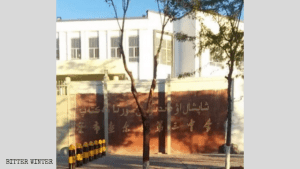 The first was addressed to the United States, asking that they never leave the Uyghurs alone, people persecuted only because of their ethnicity and faith. The second appeal was to anyone who would happen to travel to China: to ask the question “Where my mother, father and siblings are?” on her behalf. In the first panel, Documenting the “Re-education Camps,” the speakers were Timothy A. Grose, a sinologist of the Rose-Hulman Institute of Technology in Terre Hauste, Indiana; Seiji Nishihara, an economist at the International University of Kagoshima, Japan; and Sophie Richardson, director of the China Department of Human Rights Watch. Prof. Finley offered first-hand impressions of the complete change that occurred in the Xinjiang society due to the recent recrudescence in the repression of that region’s inhabitants, a region which lives in fear and is distressed by uncertainty. Reconnecting with Prof. Grose’s presentation, Finley underlined the psychiatric approach to the problem of religion used by the CCP, which treats the faithful as alienated to be rendered harmless and to be corrected. Her speech has also touched on the taboo that no one dares to cite, but of which there is a lot of great evidence: the ethnic and cultural genocide that is slaughtering Xinjiang. A crucial concept introduced by Finley is that of “fear of the mosque”: that is to say the “sacred” terror that the CCP feels towards everything that even remotely recalls the faith of the Uyghurs, which is to be eradicated with a forced secularization of customs and traditions that needs to be de-sacralized and sinicized. On the same wavelength, Prof. Byler documented the “re-educational paternalism” implemented by the regime in the Uygur region. Human Rights Watch estimates that about 10% of Uyghurs are currently held in “re-educational” concentration camps. Millions of people are then subject to “rectification” and a million government officials, as Bitter Winter has documented, are employed in monitoring ethnic Muslims. In short, the state functions as an Orwellian “Big Brother”, which, with the excuse of national security, suffocates society and religious beliefs through an increasingly strict and effective control. Prof. Millward chose an original topic. The empires, supranational entities by definition, he said, have always been able to deal with cultural, linguistic and religious pluralism effectively. Of course, the historical empires have all been different, one from the another, but they have, nonetheless, favored an undoubtedly undemocratic social composition by modern standards, yet objectively functional. The nation-states, which by definition are the negation of empires, have instead never been able to deal with the problem adequately: suffering from endemic nationalism, they rather have always exacerbated it. From an indeed not nostalgic point of view, Millward affirms that this question is constantly re-emerging. Today’s China has inherited an empire, but it has turned it into a large nation-state, in which nationalism, in the form of sinicization, has transformed socialism into an even greater nationalist problem.